A few weeks ago at the 121 Mining conference in London I had the chance to talk to Peter Berdusco, CEO of Guyana Goldstrike. We talked about the exploration potential at their property, why Zijin Mining Group is one of their backers, and what’s in store for 2019. 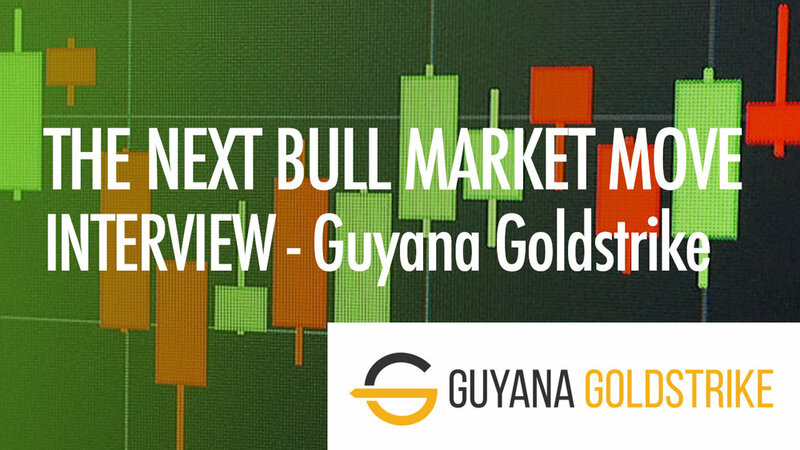 On The Next Bull Market Move, we have a brand new guest, we have the Peter Berdusco, CEO of Guyana Goldstrike. How are you today Peter? Very good, thanks for having me. No problem. We were talking earlier about the results you had a couple of weeks ago, can you talk about that? We've been really fortunate. We have a new discovery area on our property called Toucan Ridge, and this is a result of the trenching that we started back in May, June. Basically the trenching came about from a financing that we did with Zijin Mining Group out of China. Zijin Mining being the biggest gold producing company in China, they backed us for 3.2 million dollars, and we've taken that money and put it to good use. Our mandate was to explore the property for additional ounces - we already had 350,000 ounces in a 43 compliant 43-101 with one of our zones called the Mazoa Hill Zone. And so Zijin really wanted us to use their money and build ounces on the property. So we did that with trenching areas of interest - we were on the Toucan Ridge area of interest and we started getting some really, really good results. Like really good interval lengths, good grades and with every trench we do, we continue to get mineralization. We're up to, I think about eight or nine trenches on this ridge. This ridge extends over two kilometers along the ridge. And we're just gonna continue on here, this looks to be a large zone. It looks like this will be our priority area that we're gonna be drilling in Q1 of 2019. And confirming this at depth - it really is game on for us in terms of adding ounces to the property. And just the size and the quality of the mineralization we're getting at this zone can be a game changer for the Marudi Gold Project. One of the characteristics that we really liked about this property was the prior operators or explorers who only focused on 5% of the property. And it's really centered around where the mining camp is. But what we did which no prior operator has done is we ran an airborne survey a couple of months back and for this survey now, we're waiting for a final report. But this survey's gonna open up a lot of areas on the property for further exploration. There's a strong relationship on the property of gold with magnetite. And the magnetite is gonna light up with the magnetic survey. So we're looking for similar signatures of where we know the gold is, and if we see other signatures nearby or close by or along this general trend of where we are, those are further exploration areas that we're gonna go after. So again, bottom line is, these tools and data will give us the ability to build those ounces and then hopefully get it to a mass that's gonna attract a mid-tier or a major. We were talking earlier as well about Zijin Mining Group and they currently have a 24% interest. Can you give our readers an idea why would they be involved in a small junior like you? Yeah, really good question. Number one, Zijin is involved all over the world, so they have participated in mining operations, purchased mining operations in various parts of the world. And so one area where they've had generally limited exposure is South America. So they were looking there and they were looking to see how can they get a foothold, how can they get involved. We were fortunate enough to present our opportunity with the Marudi Gold Project and what they saw in the Marudi Gold Project was a real potential to drive ounces here and to grow those ounces. And so they saw a real swing for the fences in terms of exploration, but it's also complemented with the fact that we do have a mining license. And we're fortunate enough that it can take some time to get a mining license into place. And so we sort of hopped over that by having that already in place. And so we get our ounces to north of a million or around a million, and now you get into a scenario where coupled with the mining license you can potentially go into production. So for someone like Zijin, where they do go after producers and buy them, it was a good scenario for them, and it was a smart investment. It was a good entry point - three million dollars is not a lot of money for them so it made a lot of sense. Let's go through the next 18 to 24 months, what have you guys got planned? Well, it's gonna be busy. In Q1, we're going to start our initial phase one drilling. We're gonna try to prove out the depth at Toucan Ridge, mineralization at depth, that's our goal, our objective. We will be additional drilling phases beyond that, many drilling phases, it'll probably move on beyond Toucan Ridge as well, and we'll be trenching the whole way through the year. So we'll continue to trench Toucan Ridge and then we have five other areas already identified, areas of interest for trenching. And then we'll have to see what the airborne survey report brings because that'll open up additional areas too. So it's gonna be trenching and drilling and you know what that means, it's gonna mean lots of news flow. We've been fortunate enough to have almost weekly news flow and that'll continue right throughout 2019. As a final question, for new investors looking at your company, what would you tell them? Why should they invest? If they're looking for a junior that has the possibility of a big re-rating or upswing, you want to look for a company that's on the verge of really making a substantial change to the number of ounces they have in resource. The historical data has really stacked itself up to put us in a winning situation with our trenching, with our drilling. And this will drive the ounces throughout the year. And ounces add value, add to an asset's bottom line, and that drives the stock price and that's where your return is. So if you want that hockey stick return, and everybody talks about the 10, 20 bagger, that's the opportunity that Guyana's potentially giving you. Great, thanks for having me.